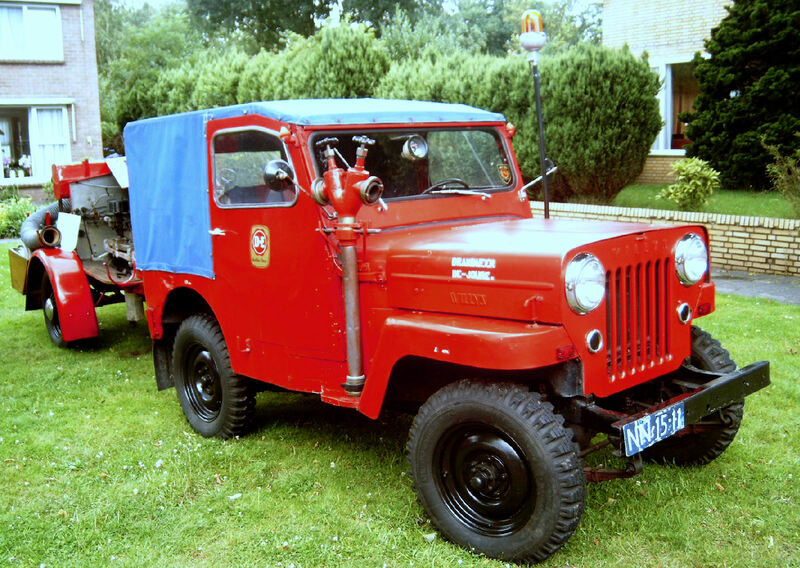 I haven't seen a lot of photos of CJ-3B fire Jeeps in the Netherlands, but the ones I have run across are very interesting. Maybe just because they are different from most of the Willys conversions in North America, and maybe also because the photos I've seen don't reveal all the details, so there's still some mystery involved. Dutch importer H.C.L. Sieberg had sold some CJ-2A and CJ-3A fire Jeep conversions by apparatus builder Kronenburg. However, Nederlandse Kaiser-Frazer (NEKAF) who began assembling CJ-3Bs in Rotterdam in 1954, decided to go a different route. 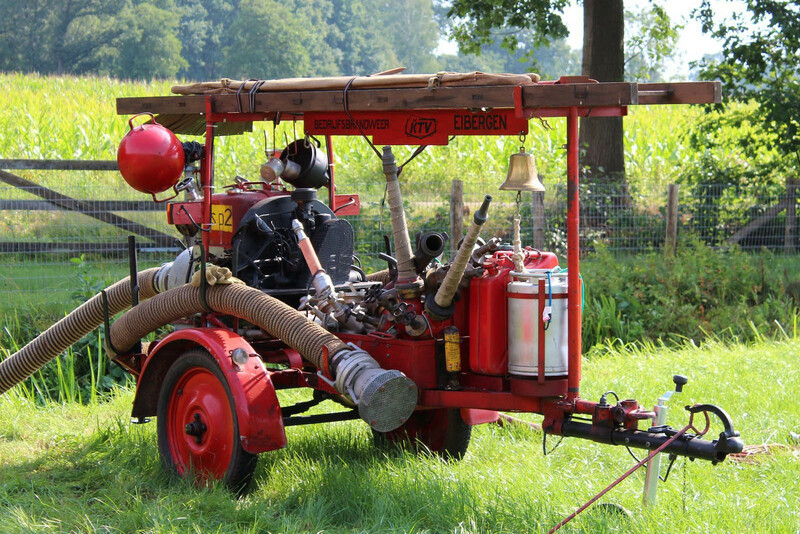 W. Schuitema found this photo of a unique conversion by Van Bergen, a long-established apparatus builder in Heiligerlee, in the Groningen area. It's based on a CJ-3B assembled at the NEKAF factory. 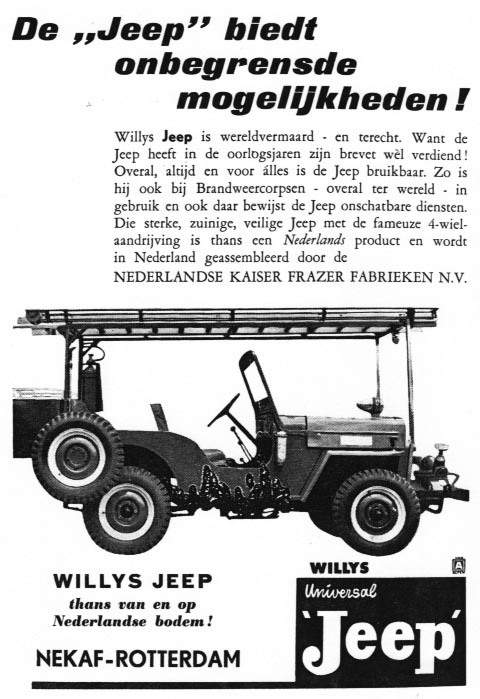 NEKAF decided to advertise Van Bergen's conversion as their own product, just as Willys did for Jeep fire engines built by Howe or General in the U.S., but apparently they didn't have any success in generating further orders. This photo is from a mid-1950s NEKAF ad (100K JPEG). 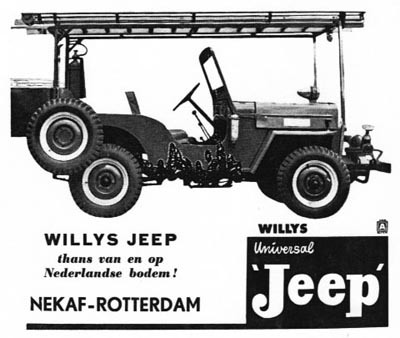 Some of the Dutch text reads: "The 'Jeep' offers unlimited possibilities! 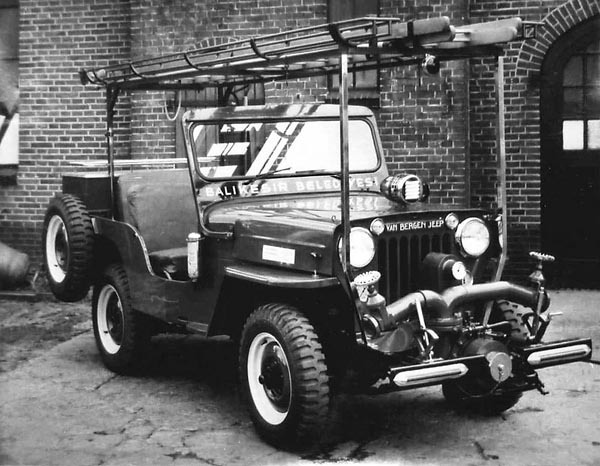 Willys Jeep is famous the world over -- with good reason. Everywhere, always and for anything the Jeep is useful. So he is in use by fire brigades -- all over the world -- and has proved invaluable in many places. 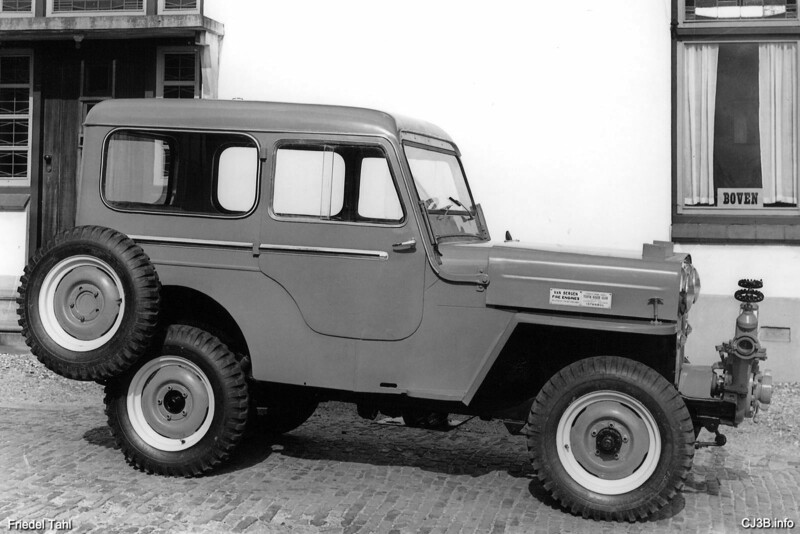 This strong, economical and safe Jeep with the famous 4-wheel-drive is now a Dutch product and is being assembled in the Netherlands." 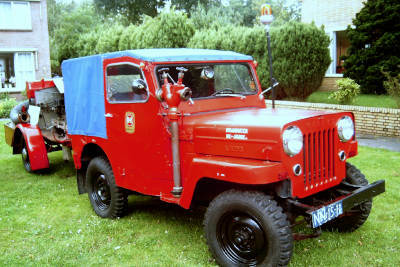 Jan Hogendoorn sent this photo of a more basic CJ-3B pumper built by Van Bergen. 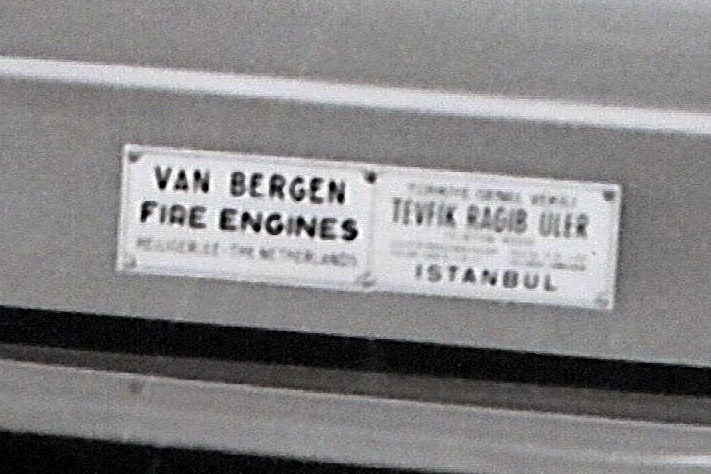 Jan has also discovered that in 1954 Mr. Van Bergen indeed went to Turkey and received a large order for fire engines there, but further details are unknown. The builder's plate (80K JPEG) seen on the hood of the Jeep above, shows the name of the distributor in Istanbul, Tevfk Ragip Üler, so clearly Van Bergen built this unit to order for them. Tevfk Ragip Üler in Galata, Istanbul was apparently well established by 1954 as an importer of firefighting equipment. 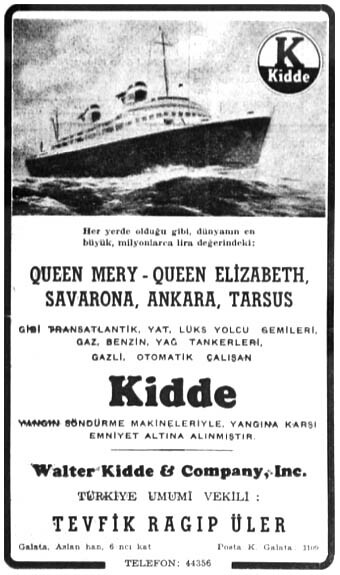 This newspaper ad from Yeni İstanbul , 18 January 1950, shows the firm advertising Kidde fire extinguishing systems, as used on passenger liners! This nice CJ-3B served the large industrial facility of Koninklijke Textiel Veredeling ("Royal Textile Finishing") in Eibergen, in the eastern Netherlands near the German border. See a closer view of the pump trailer (370K JPEG) which is marked Bedrijfsbrandweer KTV Eibergen ("Corporate Fire Brigade KTV Eibergen"). Thanks to Oldtimershow Diepenheim for these 2018 photos. 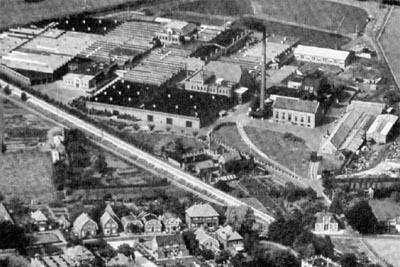 KTV was a major employer in the textile industry in Eibergen from 1830-2004. This 1953 aerial photo showing the plant as it was when protected by the Jeep and trailer, is copyright Aerocarto KLM and courtesy of Historical Circle Eibergen. 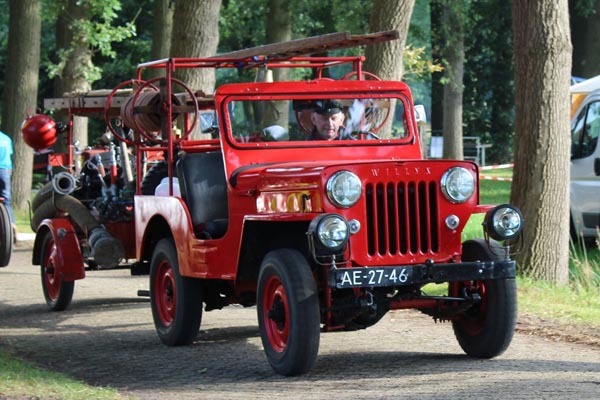 This photo of the KTV Jeep at a 2017 display is courtesy K. Verhoef and Historical-Fire-Engines.com. See a larger photo (320K JPEG) by Jean-Paul Heyens. This impressive unit was in service in Joure, Netherlands and now belongs to a private collector. It's a major aftermarket conversion including hard doors and new front fenders. More information on this unit and where it might have been built, and on this photo, is welcome. 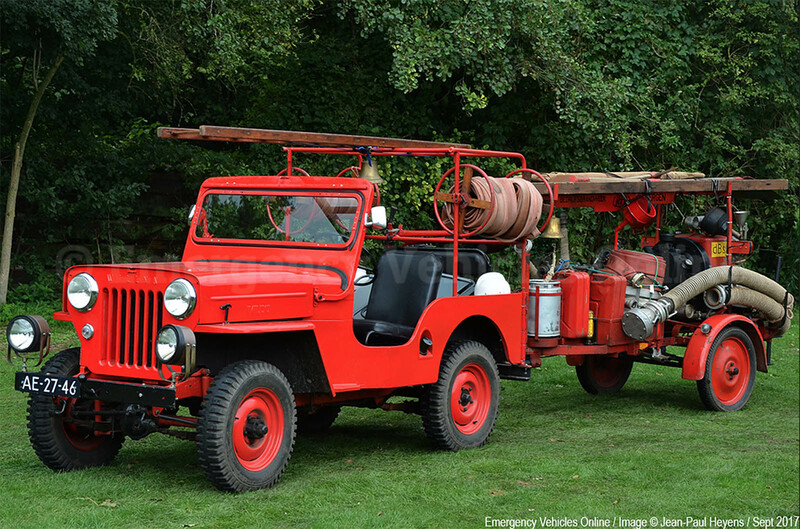 Here is a slightly mysterious fire Jeep found in the Netherlands and photographed for Historical Fire Engines Europe. This photo by G.P. 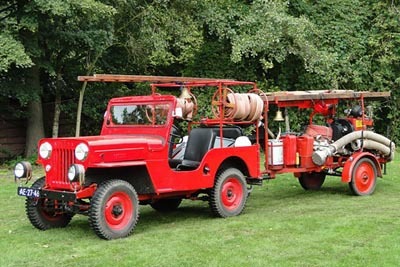 Koppers appears to show a Willys M606 converted to pull a dry chemical extinguisher trailer for the fire brigade in Baarn, Netherlands. 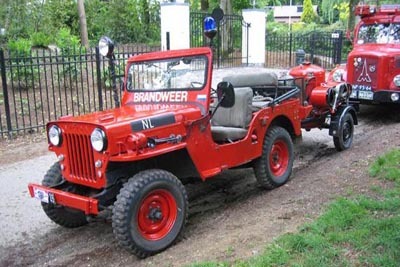 See some CJ-3As built by Kronenburg in the Netherlands in CJ-3A Fire Service Jeeps. 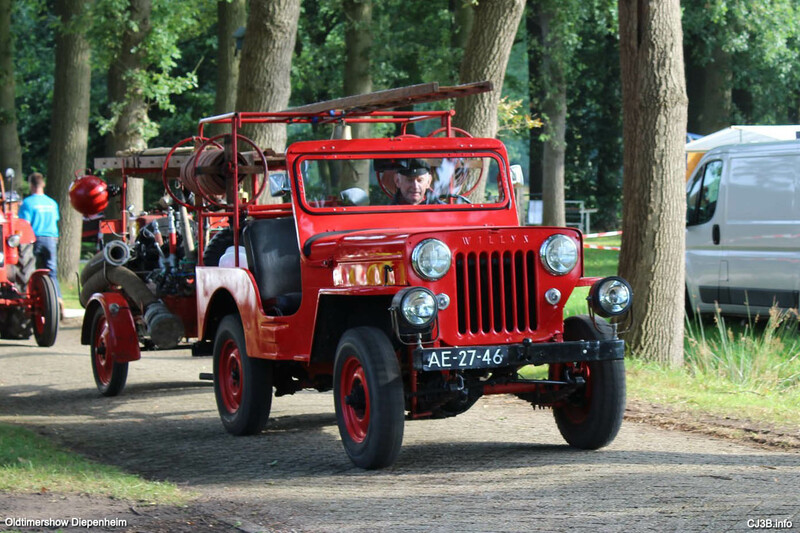 See more Jeeps in the Netherlands.